The extent to which parliamentary hatespeak has contributed to New Zealand's Christchurch massacre in the mosques will become better known as the Australian who has been charged with this heinous crime comes before the Court. Successive Australian governments have shamelessly and illegally treated refugees and asylum seekers as sub-humans. The Liberal National Party Coalition, in particular, continues to beat the propaganda drum with a maniacal and sometimes messianic fervour that borders on criminal incitement, and is defiant of international laws and covenants co-signed by an Australian pen with ink sometimes red and still warm with Australian blood. Were it not for a vigilant, disparate and dissenting national peace army of civilian activists, drawn from all walks of life, various refugee advocacy agencies, courageous whistleblowers and media, the incessant lies, misinformation, and disinformation peddled by the Coalition, would not have been publicly exposed as a mostly malicious litany of fake news. The offshore illegitimate outsourcing of our conscience and refugees to sub-contractors, other governments and other countries of our refugees is more than political cowardice by our governments. It is more than a billion dollar people trafficking rort by the LNP; more than a lucrative cashcow for corrupt officials, shonky operators, fraud and scandal. The long years of secrecy and lack of transparency of what has happened – and is still happening – on the islands of Manus, Nauru, Christmas, Papua New Guinea, the United States and elsewhere will no doubt contribute to the Coalition’s undoing in next month’s federal election. The isolating of refugees fits into the sordid and defamatory narrative that all refugees are terrorists, rapists, murderers, criminals — too dangerous to be allowed to set foot on Terra Australis. And that includes babies and small children. OUR WHITE COUNTRY! OUR WHITE RULES! The Government will argue that there is "no refugee problem". That’s true, in the sense that it is the Government(s) that is the problem. The Government argues that there are fewer people in detention centres, et cetera. In fact, the "refugee problem" is greater than ever and the consequences of our brutality have already fuelled ominous legal and societal challenges on our own shores and beyond. We who care need to fight harder and not lose momentum but instead accelerate efforts to bring about reform, justice, redress and reparation. The political and legal ramifications of our mistreatment of refugees will extend far beyond the barbed wire fences. The suicides, the self harm, the deprivation of medical attention, the physical and mental harm we have caused, the destruction of families that we have authored and authorised to others, means that we will ultimately be held accountable, if not on a national basis then perhaps in an international court and before an independent arbitrator. Some of our misconduct not only flouts the United Nations Universal Declaration of Human Rights, but falls under the distinct character of war crimes and torture. The day of reckoning will be late, but it will come. We are the collective voice of the refugee. We must in all conscience speak where they are denied a voice. We must walk where they are forced to kneel. We must expose the lie masked as truth. Refugees are our brothers and sisters; our children. They are us. They are not "the other". We are all "the other". We are all refugees of some kind, surely, just as many Indigenous Australians have long been refugees in their own country. In all the discussions, interviews and broadcasts I’ve done, not once have I met an indigenous Australian who begrudged refugees refuge in this, their own country. Why doesn’t the colonial government that has been imposed upon our First Nations, learn from this? It would be wonderful if you would join me and thousands of ordinary Australians throughout the nation on the Palm Sunday Walk for Justice for Refugees. It is such an uplifting experience. In Melbourne, we’ll gather at the State Library on the corner of Swanston and Elizabeth Streets at 2pm. Please come along. Let’s support one another. And let us become visible where the offshore refugee is so often forced to be invisible. Let love not hate overcome the autocratic bullies who squat in our debased parliaments, state and Federal. The walk is a manifestation of community solidarity for Justice for Refugees in the face of white nationalism and the "Let’s Make Australia White Again" whitemanifesto. Let us show our dissent; our rebelliousness, our refusal to acquiesce to political tyranny and treachery; our resolve to champion the refugee and asylum seeker. We are among their number. It is not weak to speak of kindness, nor to speak of a shared and common humanity and compassion. Nor is it weak for the law, bureaucracy, justice and governance to embrace the human condition, and to designate for social justice and the notion that we all should be the first among equals. These are not heretical profanities. One of the key speakers will be Manus Island prisoner, Kurdish-Iranian refugee Behrouz Boochani. Ironically, the journalist, activist and filmmaker is the recipient of January’s 2019 Victorian Premier’s Literary Award for his book No Friend But the Mountains. He will appear by phone link and his entrapment on Manus is proving the old adage that the pen is indeed mightier than the sword. He is a powerful figure on the international stage and, despite all that the LNP has done to disable him, they have failed to imprison his mind, voice and formidable advocacy for refugees and justice. The Walk is about the community to which we all belong — the human family. Let us not be shy and welcome "them" to the "us" that is Australia. The fabulous big-hearted Welcome to Country will be led by Wurundjeri Elder Colin Hunter Junior, who is also on the Wurundjeri Tribal Council’s Committee of Management. Each step in this walk takes us closer to Justice for Refugees. For us, it’s a mere stroll, but refugees and asylum seekers are still walking the long walk. Bring them here. Bring them home. Australia’s treatment of refugees continues to be inhumane and unjust. Join the Walk for Justice for Refugees on Palm Sunday, 14 April 2019. For a fair and welcoming society, close Manus and Nauru and bring them here. Music from 1.30pm, speakers from 2pm. Walk from 2.45pm to Kings Domain for music by Melbourne Mass Gospel Choir and others. Half of the speakers will also be at this end of the march. 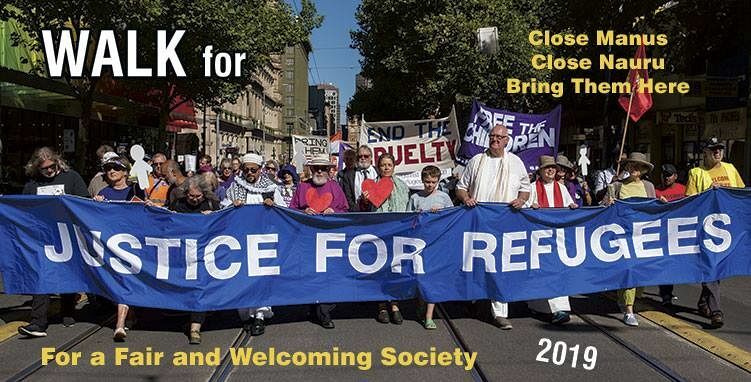 Stand up for a fair and welcoming society by joining the Palm Sunday Walk for Justice for Refugees in 2019.